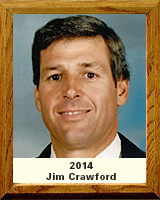 Jim Crawford attended Rincon High School where, in 1968, he won All State honors in both basketball and baseball. In basketball, Crawford was the state’s second leading scorer averaging over 23 points per game. That same year Rincon’s baseball team was runner up for the state title. The team’s pitching staff included Crawford and another future Major League pitcher – Pat Darcy. Crawford was selected for Arizona’s All-Star teams for both basketball and baseball. Crawford was drafted by the San Diego Padres out of high school but elected to attend Arizona State University on a baseball scholarship. He was part of ASU’s 1969 NCAA national championship team, as well as the 1972 runner-up team. He is still first in the ASU record book for most single season and career shutouts and remains among the top five ASU pitchers for total wins, strikeouts, and innings pitched. He is tied for first place in the College World Series record book for lowest earned run average (0.00) for pitchers with at least 20 innings pitched. Crawford played for the Anchorage Glacier Pilot baseball team all three of his college summers winning the National Baseball Congress World Series two of those years. Crawford was drafted by the Houston Astros out of college and was pitching in the major leagues the next year. In his first major league at bat he hit a game-winning extra-base hit in the 12th inning to earn his first big league win against the Los Angeles Dodgers. In his major league career he appeared in 181 games over five seasons with the Astros and the Detroit Tigers.